How much will it cost to make guided meditation app like Calm for sleep and stress reduction? Stress and fatigue are two roots to several problems people coming from all walks of life are prone to. Stress eventually leads to decreased productivity and may even end up in depression or other mental health issues. The solution to this is a rather simple way to look at things by using meditation techniques. Increasingly, because of influencers like Deepak Chopra, Eckhart Tolle and Wayne Dier, people have started paying attention to the knowledge one can attain by meditation. Like yoga, meditation in its simplest form is easy to learn but tough to practice. Having that said, in order to learn the nuances of meditation, people need guidance from more seasoned practitioners. This is where one can find a resounding business opportunity to look into. One such guided meditation app is Calm. Calm has developed a strong brand amongst its followers. After its 6 years of operations Calm has been able to carve its own niche in people’s daily schedules. Calm has raised $28 million in its 3 rounds of funding over 6 years of operations. Calm had hit revenue levels of $40 million in 2017, which has grown to $60 million in 2018 so far. In 2017, the meditation market in USA itself was worth $1.21 billion which is expected $2.08 billion by 2022. A parallel to the meditation industry, the yoga industry is worth $16 billion in USA. Calm is called by its founders – the Nike for mind. It was founded by two British entrepreneurs who decided that they can provide a great solution which will have the potential to fight stress, sleeplessness, fatigue and decreased productivity. 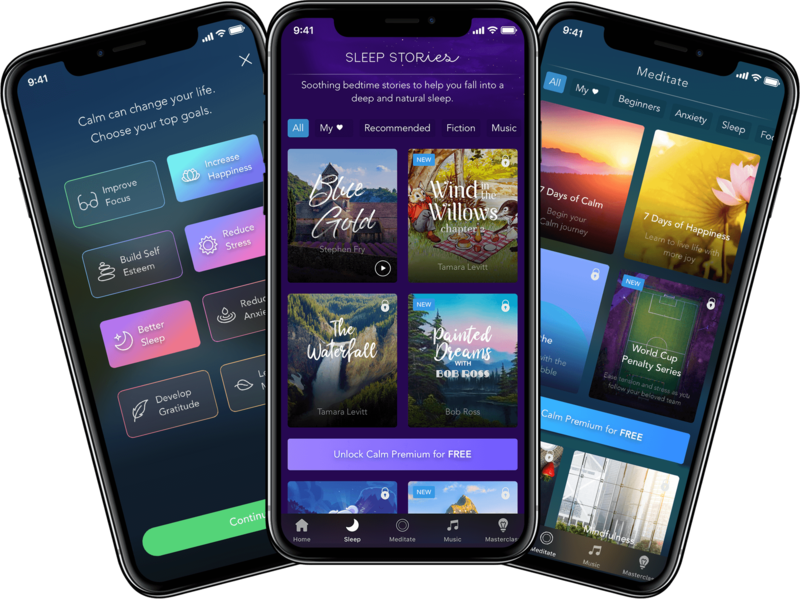 What started as a simple library of relaxing sounds from the nature and guided meditation compilations, has now become a multimillion dollar brand which is turning out to be a big influencer helping people lead better lives. Looking to develop your own guided meditation app like Calm? Increased workloads leading to stress amongst millennials. The increased need of self-awareness. The insightful thinking of reaching the epitome of one’s aspirations, which demands increased productivity. Hence, the market will keep growing till guided meditation becomes an everyday part of our lives like breathing, sleeping and eating. The players who will emerge victorious out of this battle would be the ones who evolve into a brand and have multiple offerings starting with the app, content, courses, studios and physical training. All of this begins with your own guided meditation app and that is where we can help you out. We are a team of experienced app and software developers, UI/UX designers, product managers and business analysts who can support you in achieving the very heights you aspire to take your business up to. We have an extensive experience in developing apps for clients as per their specific demands, briefs and needs. Developing a guided meditation app like Calm will cost in the ballpark of $28000-33000. Here is a detailed bifurcation to guide you through the apps and features building up these costs. In addition to this, we can help you add an analytics system to help you study user behaviour on your app and a chatbot API for allowing your user to interact with an AI powered instructor. We can integrate the app with various wearable devices like Android Wear and Google Fit to access the app on-the-go and keep your progress on your wrist. Let’s Nurture is a unique pool of expert resources who will make your calm awesome. 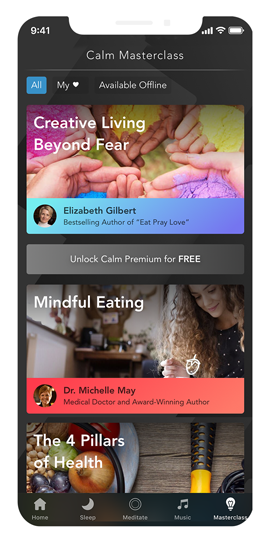 Why you should team up with us to develop a guided meditation app like Calm? We have deep expertise in developing client brief based apps. We quote a very realistic and affordable development fee. Because of our internal quality processes, we guarantee app approval on IOS and Android. We offer app developers, UI/UX designers, product managers and business analysts – all in one team. We help you out from ideation, to wire-framing, to adding strategic features, to iterations and finally to launch. 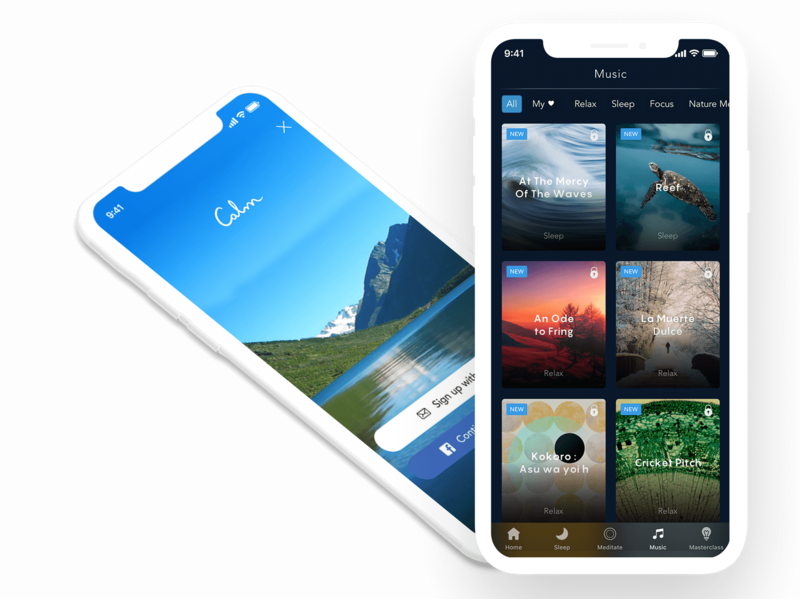 Want to have unique features and best-in-class UI/UX for your Calm sharing app? Calm already exists as a product. Is it in our legal rights to develop a similar product? It is not like we are making a replica of Calm or trying to copy its business model. The only commonality is that both mobile apps will be based on the concept of meditation and stress relief. How many iterations can I have in the product development journey? You can have upto 3 iterations during the design finalisation phase and SRS drafting phase. Once approved, scope of deliverables will be fixed. Will the app be functional without an internet? Only downloaded media can be accessed without internet connectivity. Additionally native functions like alarm and notifications will also remain functional without internet connectivity. Can this guided meditation app be integrated with the Apple TV? Of course, we are specialized in Apple TV app development and we will help you in launching your own guided meditation app into Apple TV App Store. Your users will be able to find your guided meditation app by its name in Health & Fitness category. Have an !dea to develop guided meditation app platform like Calm?